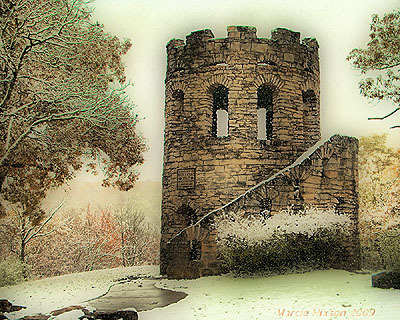 Have you ever received information about Clark Tower in Winterset Iowa? We hiked up to it, and have pictures. It is not a true castle, basically looks like a tower, but it does have the crenelations. I would be interested in knowing who built this and why. I recently came upon your site. I looked at what you had listed for Iowa. You asked for information on the Clark Tower in Winterset, Madison Co., Iowa. I have some information for you. 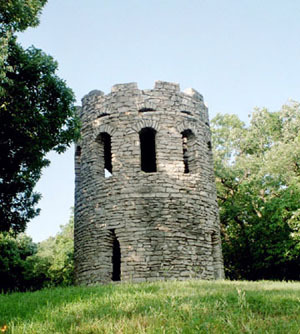 Situated in Winterset City Park , Clark's Tower was erected in 1926 as a memorial to one on the county's first pioneer families by their descendants. Dedicated in 1927 to honor Caleb and Ruth Clark, early settlers in Madison County. Constructed of native limestone, The tower measures 12 feet in diameter and stands 25 feet tall. Visitors must drive or hike the 1.5 miles to the tower which is on a rock road that winds around the back of this park. The view of the Middle River Valley is worth the trip. I am a great-great-great-great granddaughter of Caleb and Ruth Clark, for whom this tower in Madison County, Iowa, was built. It is another spectacular monument to add to the famous covered bridges of the area! My parents first took me to the tower when I was thirteen years old, and to a little child it truly did seem like a castle! You climb a spiral staircase up to the top and then can look out for miles around. My grandfather told me that they used to watch for Indians on this hill...obviously before the tower was built in 1926. :) That could just be a story, but it is what has been passed down to me. Caleb Clark was a stone mason by trade and was the first settler of Madison County. He and his wife Ruth Clanton Clark were the parents of fourteen children. Many of their descendents still live in and around the area. When I was five years old, my family moved into a new town and came to realize that our neighbors across the street and also five houses down the road were descended from the Clarks! Several men in the Clark family donated their money and labor to build this tower. Joshua Clark, a son of Caleb and Ruth, was also a stone mason. He cut the stone used in the stairway, and this was the last work he completed prior to his death in 1915. The other men who built the castle were Delvert Clark, Sam Rogers, Henry Wilkinson, and Everett Clark. There used to be family reunions held in the park where the tower is every summer. My grandfather fondly remembers them as a child; however, each branch of the family sticks to itself more now. (There are just too many of us!) My cousin gave birth to a baby boy on November 1st and named him Clark after our ancestor. Little Clark is a welcome addition to our family! In 1944, my parents were married at Winterset Iowa, and their first meal together as a married couple was at the park where Clark Tower is located. Although I do not know of any connection to the CLARK'S for whom this memorial was built, my Father's first name is Clark, and he was so named because this was the maiden name of his Grand Mother. My Father (Clark Dewaine Lamb 08 Jan 1914 ~ 03 Jan 2006) was a highly respected and favored family member and babies in our family are named for him. Duffy Clark Cannon, a grand son, born in 1970, and Great Grand Sons, Connor Clark Cannon born in 2007, and Mason Eric Harold Clark Carson, born in 2008. Two more babies are expected in our family this year and I have no doubt if either or both are boys, they too will be named for him. Clark Tower has been long been a favorite place to visit, but I had never really questioned WHY it was Clark Tower, who had built it or when, until last week. We bought a home in Lorimor Iowa about 15 miles from Clark Tower, and in the house was a photograph of the tower. My Mother than made mention of it's special significance to me, and I began researching to learn more about it. Now, am wondering if the Clark Family for whom this was built is related to my ancestors. Another puzzle in life to solve! I am sending you a photo of the Clark tower building in Wintersett Iowa. I went there to photograph the bridges & it was early fall. They had an unusual winter snow for Oct...10th. You can see by the color leaves still on the tree. It is snowing in this image. A special thanks to Brian Showen for taking and sending the first photo. A special thanks to Marcie Hixon for taking and sending the second photo.